When one of own race directors inspires you, it isn’t always just because they are a colorectal cancer survivor or someone that has been affected by the disease. It is because they make you want to live life. So many Get Your Rear in Gear race directors go the the distance, no matter the challenges put in front of them at the gate. Our Charlotte race director, Sue Falco, is going the distance with her positive outlook on life, strength and possibilities. So, even now, being recently diagnosed with metastatic colorectal cancer, we believe she is Suecretariat in the Kentucky Derby. The night after surgery to remove tissue samples from her lung, Sue was up at two-o’clock in the morning coming up with ideas for cancer patients. I luckily received a motivational call from Sue last Friday. You would never know she had received news that her race track now has a sharp incline and now in a double marathon with cancer. The call was filled with laughter and bubbly talk even laughing when she said, “I will be so pissed if I don’t beat it!” Like so many of you that are in the long distance run for your life, you pick us up. You slap us straight. You motivate us. For Motivation Monday, we thought we would share how Sue, the spunky mare and long distance hero, intends to approach her recent diagnosis. We are highlighting her most recent story on her blog and invite you to read all of her stories. She hopes that by living life and not talking only of cancer, her journey will help others. 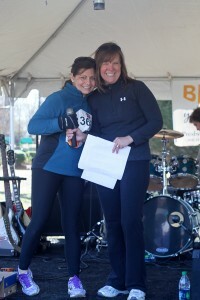 Sue plans to run the Nashville Half-Marathon, Sunday, April 28th. While training for her run, she never realized it would be the reason that could save her life. What she thought was a shoulder injury was metastatic colorectal cancer. This is the most recent blog, but you can back up to the first story written on April 5th, the night before surgery. See blog link at the end of this page! Charlotte Man to Run 52.4 Miles in a TuTu!!!!!! Are you kidding me??? I still can’t believe it and I’m not sure I will…it just sounds too crazy. On April 28th I will wake early, power down some type of fuel, have a sip of coffee and venture off to my very first half marathon. As many of you know this is no ordinary half…this event literally saved my life. Had I not gotten the guts to train for it, we never would have found the cancer and I don’t even want to know how that story ends. Instead let’s focus on what did happen. So I signed up for the training program … best $100 a girl could spend. Part of the training package is a super duper, use any time, 15% coupon for anything at Omega Sports (yup that’s the training sponsor). During my first shop prior to our first training session I met one of our coaches, Mike Vance. He’s twice as tall as me and as nice as nice can be. I remember Mike asking if I was ready for our Saturday run. (I was thinking, “Hell I had better be, it’s only two miles”). Always up for a chat I engaged in conversation and asked him what his plans were for the weekend. He responded with “50 miler.” I asked, “over the course of the weekend?” No he replied…”just one day.” Are you kidding me? I had never met anyone that ran that far…well I had, but over the course of a week, month or year. I was amazed. Mike has continued to be a source of inspiration for me whenever I run. Mike and I will be at the St. Jude Country Music Nashville Full and Half Marathon together on April 28th along with many of our teammates. Most of us are running the half (13.1 miles) or the full (26.2 miles), but Mike will run THE FULL MARATHON TWICE IN MY HONOR…I put this in caps so it is easier to read twice. I still read it and have a hard time comprehending it. So while I am plugging away at my 13.1 miles Mike will be kicking ASSphalt in my honor in a tutu!!! The funds he’s raising will go to Get Your Rear in Gear Charlotte. I hope you will help Mike and I reach our goal for this event. Funds raised will stay here in the Charlotte area to help other Colorectal Cancer survivors. P.S.. Mike and I agree that for his safety he will wear the tutu during daylight hours in the company of other marathon runners…alone, in a tutu in downtown Nashville after midnight is just not safe not matter who you are!!! Mike, you are without a doubt a Long Distance Hero!!!! To donate or read Sue’s motivational blog, click on the links below.